[To join the bingo mailing list for future years, sign up here]. 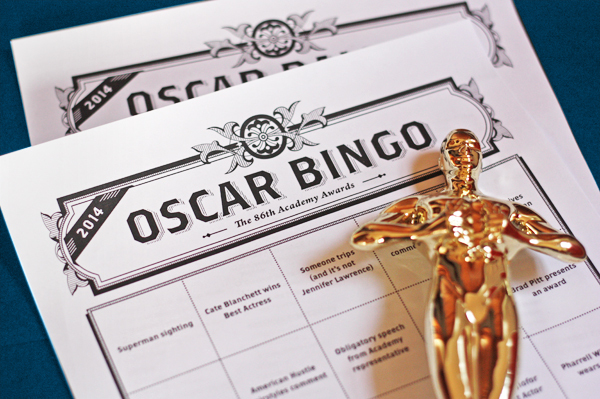 My 2014 Oscar ballot and bingo game are done! 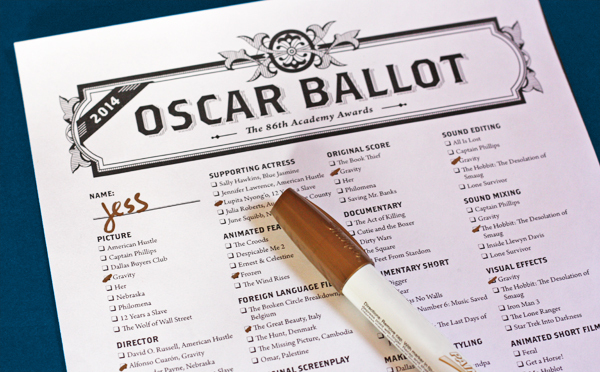 Get set to enjoy Sunday's Academy Awards with friends. It doesn't matter if they watch movies or know who the actors are; anyone can play bingo and it's a good excuse for a party. Save the PDFs to your computer, open them in Adobe Reader, and print. To use the ballot: print one for each guest and have them mark their predictions before the show starts. The person with the most correct guesses wins. Movie theater gift cards, boxes of popcorn, candy, or little Oscar statuettes from a party store make good prizes. Has anybody tried to play with friends long distance? You could each claim a page number to print out and then text or tweet each other when you get a bingo. Like every year, a disclaimer: Maybe someone will get a bingo ten minutes into the telecast, or maybe your group won't have a winner at all because my psychic powers have failed this year. Best of luck! The long distance idea is a good one! Love this. Have played several years in a row. Thank you so much! Thank you SO MUCH for doing this! It was a highlight of my Oscar party last year, and I had a calendar reminder to come to your website and print it this year. I hope you'll do it every year. I love it! Thank you again! This is year number six; it's an annual tradition! THANK YOU, THANK YOU, THANK YOU!! MUCH APPRECIATED. WE ALWAYS HAVE FUN WITH THIS! You are awesome! I'm hosting my first Oscar Party this year and am thrilled to use your designs. Thanks!! Thank you! Our family has so much fun doing this! Thank you! Our family loves playing along!! Hi Jessica, can you tell me what typeface you used for the headline? Love it! Thanks so much! I'm hosting my first oscar party this year and looking forward to using these. Thanks so much for sharing!! Thanks so much! Both were a big hit at my party last year. People are expecting them again this year. You are still at the top of my favorite blogs to read...ya keep me smiling and giggling. Thanks for passing along the fun. If I ever close my blog and start another one...I would hope it would be like yours and bring so much joy to others. Wendy, the typeface is Brothers Regular. Thanks so much for making these! I use them every year- so happy to have stumbled upon them. Thank you for making me look like an incredible Oscar Party host!! Thank you so much. We've been looking forward to this post. We're having a family party this year and we're all contributing trivia. It's been fun getting everyone involved in the planning. Thanks so much for doing this! My family has a lot of fun with them at our Oscar party. Thank you so much for doing these and continuing to do them! They are great and our Oscar parties would not be the same without them! I just have to say that I LOVE, LOVE, LOVE your Oscar Bingo. It makes watching the Oscars even more fun!! Thank you SO, SO, SO, SO much!!! This is so great as usual!! My second year using your Oscar Bingo cards and can't thank you enough for taking the time to create them!!!!! They were a big hit last year and I imagine they will be this year and every year going forward. Thanks!! Third year to do this; yours is the cutest one out there! Thanks so much!! Awesome post. This post is most important information base. Thanks for your informative post. Jessica, this is amazing! However, when I try to print out, the page is not centered on the paper, but more to the right & the bottom is cut off. Any suggestions? In your print dialogue box try checking an option to "center" the page. And then if your printer is still cutting off part of the page because it needs really wide print margins, try checking the "fit to page" option. Are you printing from Reader? Thank you for these, I am doing a post on the Oscars and I am including a link here for my readers! I'm here every year for this. You're the best. Really appreciate your Oscar bingo. We've used them for some years now and it brings lots of fun to our Oscar night. Plus it helps to stay alert and awake at 4am, along with the fruit-salad which is one of the other traditions at our oscar nights. I completely forgot about the Oscars until my 13-year-old reminded me just now. I rushed to your site and was so happy to see that you've made the ballot again! Thank you!! I love this (and linked to it since I was writing a post about it anyway!). I'm going to play against some online friends via Twitter. Thanks for the fab idea! I want to thank you as our family looks forward to this every year. My teenaged kids want to spend an evening with me!! Thank you for putting this together and emailing us the link and providing us with a wonderful family night. We used to have live Oscar parties but changed to an online one last year so that we could have overseas friends join us. And although we don't play the Bingo online, we do play it here at home while we watch. We also always put a link to it for anyone else who would like to do the same. The only thing I would suggest is to make the "commercial airs" more generic for those of us who don't live in the U.S.
Last night's Oscars were... boring. To say the least. Your Bingo and ballots were a god send! Kept the night exciting and upbeat. Thank you so much for all your efforts. I was at an independant theater and gave out 15 our 20 sheets to strangers. It was fun! I liked how almost everyone yelled "bingo" during the Superhero segment! Ha! I love your comments, guys! So interesting to hear what happens with these! Thank you for the bingo. We used it earlier this year and was a huge hit! I'm hosting an Oscar Party again in Feb. I'd hate to ask but are you planning on creating a 2015 version by any chance? Thanks. Your blog is awesome! 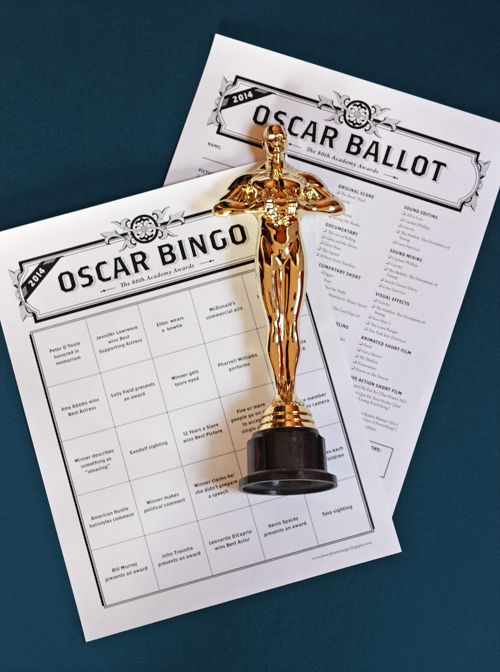 I absolutely love & appreciate the details in your Oscar Bingo cards! I am hosting my 6th annual party this year and it wouldn't be complete without your bingo game. My guests are always looking forward to it and I am so excited for 2015! The oscar goes to...you!